Added these lines, but I still can't see the md5 in the folder, even though they are on the server. Pretty strange. Thanks anyway for everyone. I must be editing in the wrong place. I set the options here, but nothing happens. What do you mean by "custom mask"? I think I'm not finding this option. 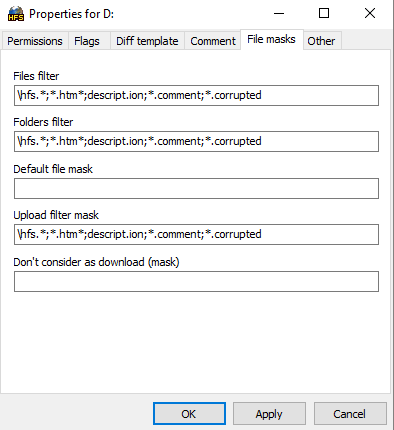 Sorry for the late response, but it did allow me to upload a md5 file to the server, but I don't see the previously md5 files and the uploaded one in the folder when I browse through HFS, even though they are there in the server. Tried to find a thread that talks about files that are present on the server, but won't show on hfs. I have a folder with a bunch of md5 files that won't show when they are accessed via hfs. Folder is set as virtual, if I change the extension to txt it shows. Looks like there's some setting of filemask that won't allow me to access *.md5 files. How can I change that?! I really doubt the so-called 'incognito' mode of Chrome works 100% flawless (talking about privacy) as they advertise (that's why I always prefer Firefox than Chrome). Chrome must be saving the cookies or the session id, or it must be messing something else. I think it's a Chrome issue, not an HFS problem. Try to recreate this, using the "New Private Window" of Firefox, and say us if this problem continues. Probably it was recorded from a previous session (Yes, it was an private window too). hence my question about the server-sided management. I'll use a cleaning too. Might be a cookie from a non-incognito mode messing up the session. EDIT: Well. Checked the option "Delete cookies after closing Chrome", stopped using adblock on incognito and kicked all idle connections. One of that options worked. Np right now. but I accessed one of the password protected folders of my server with incognito mode on a fixed IP connection. Some days later I accessed the same folder again using the same incognito mode (after closing it) and the same IP. And it didn't ask for login. or by HFS session (because of previous login and I didn't close HFS)? the /not is just for readability. When you were using the "double" command, you were saying to disconnect in both case, indeed. Awesome rejetto! My life is complete. The forums server was throwing me PHP errors the other day that I almost forgot about it. But now I can only access the index page, in the case, http://domain.com/. Every folder and file inside the "/" folder is throwing me the you fool page. I guess I need go a little further on these commands. and it is preventing to access the folders. I want to give access to the www.domain.com access too. I'm currently running HFS to host a static page (and some download folders). Apache usually have that .htaccess that can rule over direct IP accesses preventing this to happen. I put the meta tags and opengraph tags in the html, just to be able to share some links on facebook with thumbnails and such things. I'm running through CloudFare's DNS. Is that a problem? Because the crawler doesn't seem to get the html file. EDIT: BTW, since this is my first post, thanks for HFS! It's the best tool for casual users!